It’s Mixology Monday time again! This month’s theme comes from the Muse of Doom at Feu de Vie. The theme this month is Fire! The Muse has a pretty liberal interpretation of the theme so we went with grilled fruit and herbs. We decided to try a large selection and experiment. 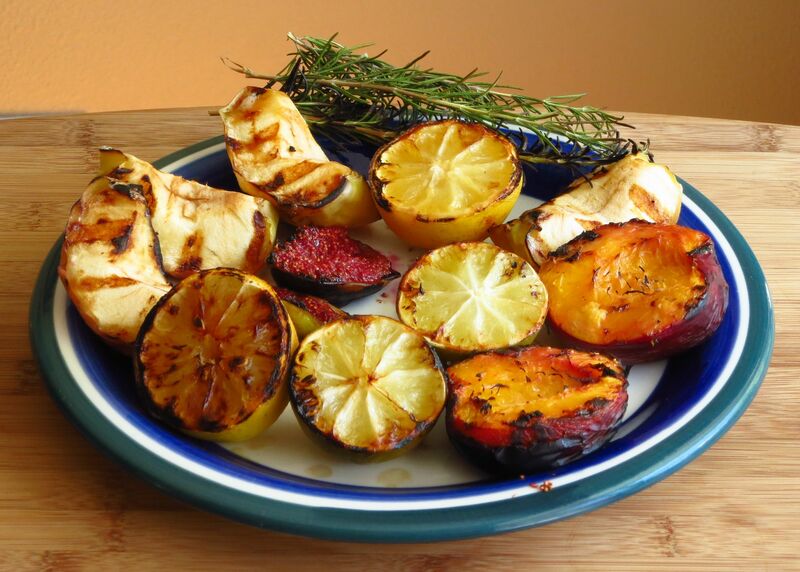 Grilled apples, nectarines, limes, lemons, figs, and rosemary. Some were winners, some were losers, read on to to find out which was which. The apples and figs were both delicious, but easily got overwhelmed with even mild spirits like vodka, so we set those aside as snacks and forged ahead. We also found that the figs and rosemary generated quite a bit of extra bitterness when grilled. Christa liked the bitterness, and thought the grilled lime and rosemary would work nicely together and developed the Pointillist out of those (so named from the speckled look of the drink from the minute bits of char floating in it), while Shaun experimented further with the grilled nectarine and produced the Bourbon Dawn. 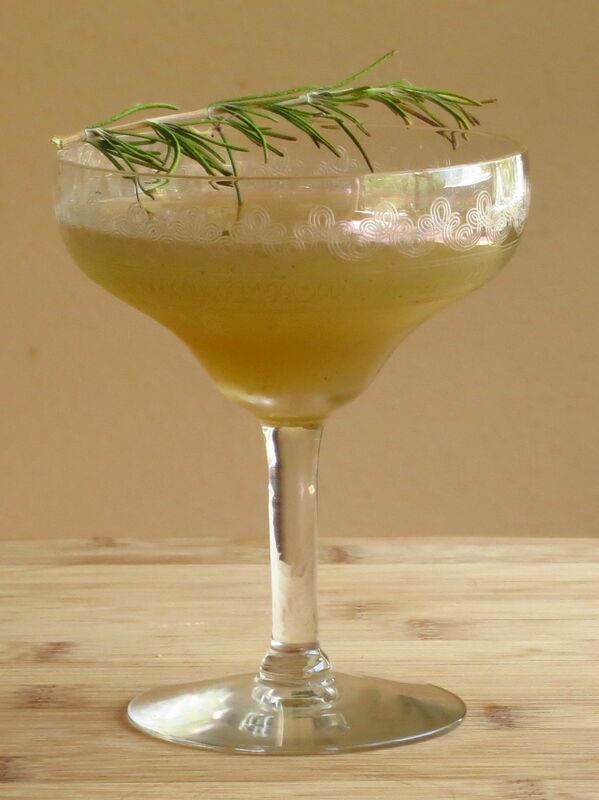 Muddle the lime and rosemary in the shaker, add the remaining ingredients, shake with ice, double-strain into a glass. Nose: Savory charred rosemary, cooked lime notes, fir & juniper from the gin, plus a little hint of mint. Savoriness of the nose gets stronger as it warms up. Palate: Sweet lime on the front, rosemary starting at the mid-palate into the finish. Really strong aromatic middle with fir, rosemary, and juniper. Charred rosemary and mint on the end. Honey nicely underpins the lime without being very forward. Bitter/charred notes provide an interesting counterpoint throughout the drink. Muddle nectarine in shaker, add other ingredients, shake with ice. Double strain into a glass. 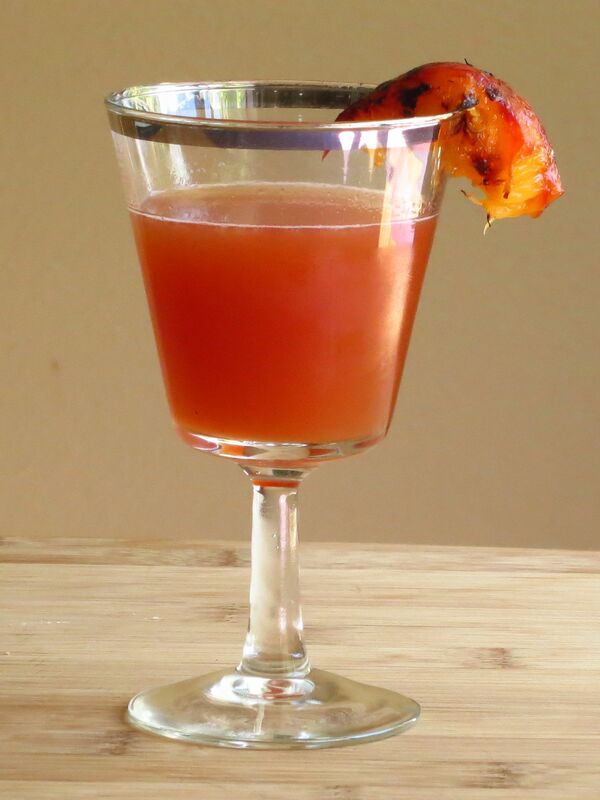 Garnish with a slice of grilled nectarine. Nose: Grilled nectarine and a strong undercurrent of bourbon. Palate: Sweet orange and cooked nectarine at the start, then bourbon and aromatics in the middle, followed by fresh nectarine and a hint of orange on the finish. Our guess is that this would also go very nicely with a couple of ounces of sparkling wine to top it off, as a sort of Bellini alternative. We really enjoyed getting to play with fire for this month’s MxMo theme, and are pleased with our flame-kissed results. Sure it’s not charred ice, but not everyone can be as awesome as this bartender. Update: Go check out the round-up. Oh man, we’re totally trying some of those smoke techniques. This entry was posted in barenjager, bourbon, branca menta, champagne, gin, Mixology Monday, Original Cocktail, rosemary and tagged angels envy bourbon, bainbridge gin, bourbon dawn cocktail recipe, branca menta, Mixology Monday, pointillist cocktail recipe. Bookmark the permalink. A two-fer! Sounds interesting and worth a try. Nice job!